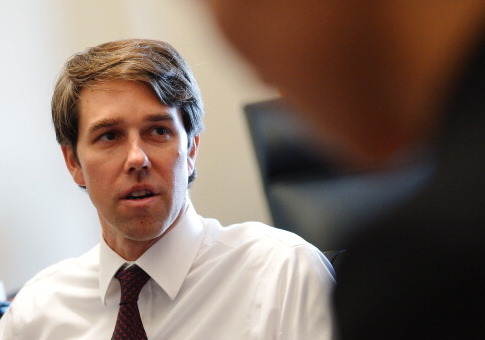 The Washington Post fact checker concluded Rep. Beto O’Rourke (D., Texas) incorrectly claimed he did not try to leave the scene of a DWI during a debate last week. O’Rourke, who is challenging Sen. Ted Cruz (R., Texas) for his Senate seat, admitted to making a mistake in driving drunk 20 years ago, but denied trying to flee. "I did not try to leave the scene of the accident, though driving drunk, which I did, is a terrible mistake for which there is no excuse or justification or defense, and I will not try to provide one," O’Rourke said. The Washington Post noted O’Rourke’s claim is disputed by police records. Early in the morning on Sept. 27, 1998, a Texas police officer responded to a motor vehicle accident. "The defendant advised in a slurred speech that he had caused an accident," wrote the officer in his complaint charging O’Rourke with driving while intoxicated. Another report notes that the "defendant was unable to be understood due to slurred speech" and that he had "glossy eyes" and "breath that smelled of an alcohol beverage." O’Rourke reportedly "almost fell to the floor" when he stepped out of his vehicle, and repeatedly failed a balance test. The results of a breathalyzer showed O’Rourke’s Blood/Breath Alcohol Content (BAC) was 0.136 and 0.134. Texas’s legal limit at the time was 0.10. A witness observed the accident, telling the officer O’Rourke had passed him at a high rate of speed, lost control, and "struck a truck traveling the same direction." O’Rourke’s car came to a stop after crossing the grassy center median. "The defendant/driver then attempted to leave the scene," according to the officer. "The reporter then turned on his overhead lights to warn oncoming traffic and try to get the defendant to stop." Another report claims "the driver attempted to leave the accident but was stopped by the reporter." The fact checker determined O’Rourke’s claim deserved a Four Pinocchio rating, which is given in the case of "whoppers:"
The police reports show not only that O’Rourke was highly intoxicated but that a witness to accident said he tried to leave the scene. This entry was posted in Politics and tagged Beto O'Rourke, Fact Check, Ted Cruz, Washington Post. Bookmark the permalink.